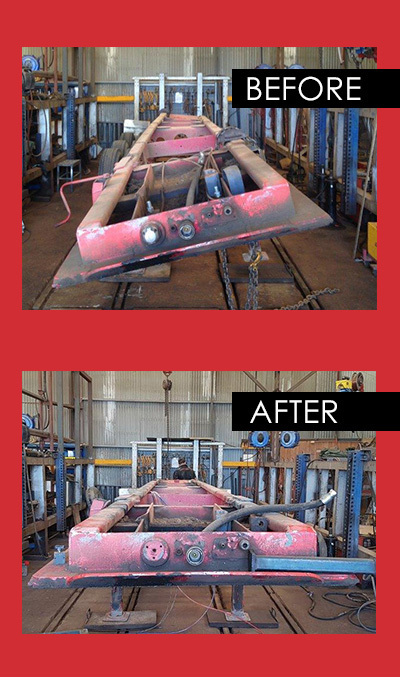 Chassis Line Toowoomba has been straightening truck & trailer chassis rails for over 30 years. The principal, Warren Southee, started out as an apprentice boilermaker & in those days back then was indentured to a blacksmith to learn his trade. Unfortunately we get a lot of rectification work caused by other repairers who do not understand the principle of heat shrinking various materials. There is no ”book” on how to go about a straightening repair, trial & error is pretty much it, fortunately for our customers this started back in 1978 so we reckon there is very little left to learn. Chassis Line Toowoomba has always offered a straightening service & we do a lot of rolled over trailers either by tipping loads or simply driving accidents. As this is generally an insurance claim our experience here is to recommend 100% National Transport Insurance (NTI) as your best insurance company, they are fantastic to work for & really do understand your issues and are motivated to get the best repair outcome possible. Something we find that is not commonly understood when making an insurance claim is how the calculation is done to decide if they will proceed to repair your vehicle. For example if they work on a pre-accident market value of say $100,000, they then get a quote from the auction houses on what the vehicle may return as a salvage item. Let’s assume the average offer is $50,000, this then means there is only $50,000 plus you’re excess to get the repairs completed. You will receive a $100,000 payout less excess & the insurance company gets the salvage at whatever the auction price happens to be. Sounds reasonable except when you cannot replace your vehicle for what they deem is the market valve, as you know circumstances change all the time & generally when you want to buy something you pay top dollar only to find later that prices have fallen. We have a saying here at Chassis Line Toowoomba “if we can hold it we can straighten it”. So be it a Truck, Trailer, 4WD or even a Header Comb, we can straighten it for you.